A randomized controlled trial in 2005 showed that a new chemotherapy (temozolomide) given at the same time with radiation therapy increased survival from 12.1 to 14.6 months in 18 to 70-year-old glioblastoma patients. Therefore, today's glioblastoma treatment consists of surgical removal of the tumor followed by chemotherapy and radiotherapy, so-called chemoradiation. In many treatment centres, chemoradiation is given also to elderly (>70 years) glioblastoma patients, even though this elderly patient group was not included in the randomized controlled trial. Randomized controlled trials are often referred as "gold standard" studies for assessing treatment outcomes. However, these studies have highly selected patient population that rarely represents the "real-life" populations. For that reason, real-life studies are needed to estimate the true benefit of a new treatment in everyday practice. In a recently published nationwide Finnish study, researched explored if glioblastoma survival has truly improved after the implementation of chemoradiation treatment. "Finland has a tax-funded and government-subsidised social welfare and health care system, where socioeconomic factors and health inequalities affect much less cancer treatments and treatment outcomes than for example in U.S. 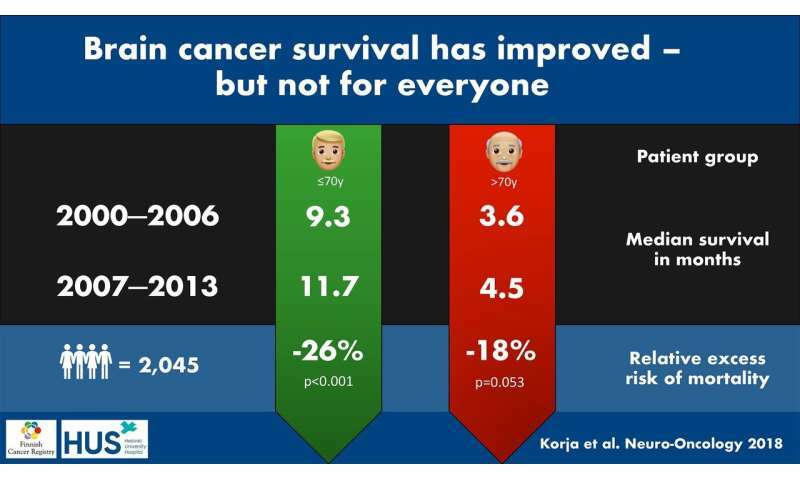 Moreover, Finnish cancer treatment outcomes are shown to be among the best in the world. For these reasons, Finland is an optimal country to conduct so-called real-life cancer studies," explains Dr. Rahul Raj, Associate Professor of Experimental Neurosurgery, Helsinki University Hospital, and one of the lead authors of the study. "We used data from the Finnish Cancer Registry, which enables evaluation of all cancer patients' survival with high quality," says Janne Pitkäniemi, director of statistics at the Finnish Cancer Registry. The study encompassed over 2,000 patients that had been diagnosed with glioblastoma in Finland between 2000 and 2013. The study was divided into two periods: 2000-2006 (prior to standardized chemoradiation treatment) and 2007-2013 (today's chemoradiation treatment widely established). "It is important to notice that the improvement in survival was notable in the younger patient group but only dismal in elderly patients. 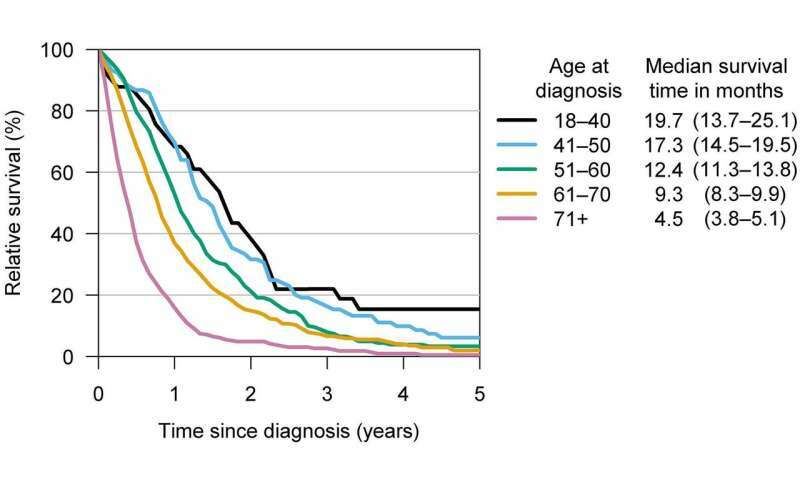 As the median age of glioblastoma patients is increasing at the same time than the incidence of glioblastoma is increasing, the number of elderly glioblastoma patients grows fast in the future. Today we do not have effective treatment strategies for this patient group, and it is questionable whether current heavy treatments and numerous hospital visits are always justified from patients' perspective," says Dr. Miikka Korja, Associate Professor of Neurosurgery, Helsinki University Hospital, and one of the lead authors. "We think our results highlight the fact that the future glioblastoma research should more and more focus on elderly, that will soon constitute over half of all newly diagnosed glioblastomas," Dr. Korja says. "We are very hopeful that survival rates will improve in the future."